All pumpkin pie things are godly. Yes, I know the seasonal fad can be really annoying. BUT unless you are just generally averse to the taste of pumpkin or the beautiful warmth of cinnamon and cloves – you don’t let the constant barrage of ‘basic’ memes bother you. While I love the traditional slice of pumpkin pie, I am in constant need. I crave that sweet, spicy taste of that holiday pie in anything I can get it in! Breakfast was a natural choice when in came to deciding how to get more pumpkin in my diet. There is no other meal where it is truly acceptable to gorge yourself on sweet things. Although – if you’re me, every meal is an opportunity for something sweet. These overnight oats are pretty amazing for the simple inclusion of one ingredient: almond butter. Yes, it’s not even the pumpkin that is the show-stopper. It’s the almond butter. There is something about the almond butter that makes it feel like you’re really eating a slice of pumpkin pie. 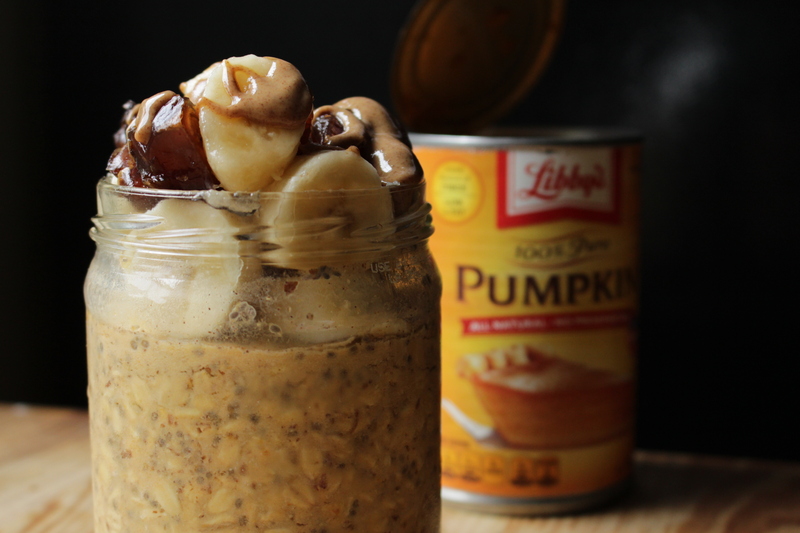 It gives the oats a certain pie-crust dimension that truly rounds out the pumpkin experience. It is my personal preference to put a generous slather of almond butter on top of the oats and then mix it in as I eat but it’s just as well if you decide to mix the almond butter into the oats. I topped mine with sliced bananas and dates to give the oats an additional hit of sweetness and I mixed in some raw cashews. Overnight oats are so incredibly versatile and nutritious – especially with the added pumpkin, which has a wealth of healthy fiber and vitamin A. I like to make a few jars with different flavors and let them sit overnight and then take my pick in the morning. Just an aside – this may seem like a lot of oats just for one person but you won’t notice. You’ll be too busy scarfing this down to worry about that. Also, let’s remember that food is fuel – especially breakfast. These oats keep me full and going until lunch and there is not a single bad ingredient in them. Let’s dispense with any of that silly food guilt. Eat! Eat and eat and eat! 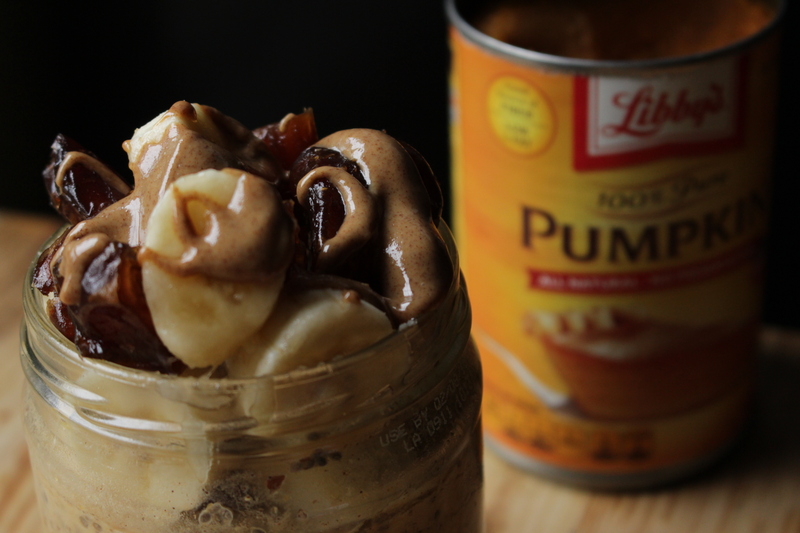 Try these pumpkin pie oats. You can ring in the new fall season with a filling, decadent, soul-saving breakfast. Option 1: Mix the oats, chia seeds, spices, pumpkin, maple syrup, and almond milk together in a mason jar. Put the lid on top of the jar and let the oats sit overnight in your refrigerator and top/mix in the bananas, dates, almond butter, and chopped nuts in the morning. Enjoy! Option 2: In a small bowl – mix the oats, chia seeds, spices, pumpkin, maple syrup, and almond milk together. Pour half of the mixture into your mason jar then layer half of the almond butter, dates, bananas, and nuts on top. Scoop the other half of the oat mixture on top and put the final layer of the fruit, nuts, and almond butter on top and put the lid on the jar and let it sit in your refrigerator overnight. Grab and go in the morning. All the lovely pictures were taken by Nick W.